The TVP T 50/51 is a Czechoslovakian tier 10 medium tank. A joint project by Škoda and ČKD. Discussions to determine the tank’s characteristics started on January 14, 1950, but the project was discontinued on March 4, 1950 by the Czechoslovakian Ministry of Defense. No prototypes were manufactured. Existed only in blueprints. The TVP is very fast and mobile, has a low full magazine reload (compared to other tier 10 autoloaders) and an insane reload between each magazine. 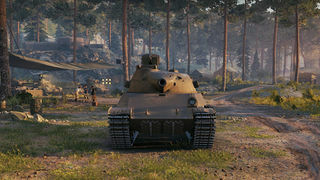 The tank is often compared to the Bat.-Châtillon 25 t as they both share the same lowest hit points of any tier 10, both have dangerous autoloaders and are both very fast; both excel in certain categories. For instance the BatChat has much more magazine potential damage (1950) while the TVP only has a (1280) magazine potetinial. You might think that the BatChat is a clear winner but although the BatChat can deal more damage, it does it over a longer period of time (10.73 seconds from the first shot) while the TVP on the other hand deals its full magazine out in only 4.5 seconds from the first shot. 4.5 seconds is quicker than every other non-autoloader tier 10 tank in the game. So if you shoot a TVP and you are not equipped in an autoloader, then expect 1280 of your hit points gone before you can even get a chance to fire another shell back at it (unless you can get in cover of course). The gun is what makes the tank, it's fast, it's accurate and the full magazine reload is not bad at all. The TVP is a tricky tank to play but in the hands of a skilled player it can be your worst nightmare. The TVP T 50/51 marks the end of its Czechoslovakian medium line. Good view range at tier 10. Can reach 445m view range without using optics, binos, or food. 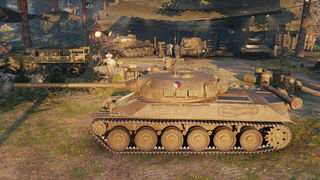 The TVP T 50/51 is completely unique to all other tanks when it comes to in game performance. With the 320 alpha, the ability to dump the clip quickly, and quick reload the TVP T 50/51 can quickly rack up damage if a player positions himself/herself properly. But, due to the lack of finishing power in the clip, lack of penetration on the standard APCR round, and the lack of HP and armor, the TVP T 50/51 can easily get itself into trouble and possibly not get out of trouble if a player is not careful with map awareness. 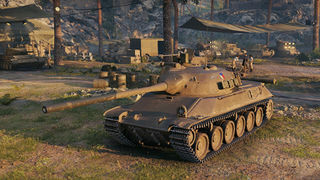 The recommended playstyle for this tank is to search for side profiles of enemy tanks which will allow you to easily empty the clip, and to immediately have an escape plan. If a TVP T 50/51 is caught reloading it will almost certainly take damage and with the lack of HP, it will be destroyed quickly. Based on the preliminary works on the TVP concept from January 1948, in January 1949, the HQ of the army issued an official request for a tank project to Škoda and Praga. For Škoda, the project had designation T-50 (task 181 B), for ČKD (Praga), the designation was T-51 (task 181 A). By the end of 1949, both the T-50 and T-51 project were united into the T-50/51 project. Former competitors were (because of the orders from ministry of defence) now working together as allies. Both companies were to present their “own” T-50/51 prototypes, the difference between which was mainly the engine used. By the end of 1949, a coordination office was created in order to support the cooperation. However, the serious differences between former projects led to development being started from scratch. During one of the first coordination office meetings on 14.1.1950, the basic specifications were discussed: 35-40 tons. The army requested the speed of 60 km/h, but Ing.Surin of Praga (possibly the most famous Czechoslovak tank designer ever, responsible for the LT-38 for example) stated that this request is unrealistic. On 16.1.1950, the hull shape and engine compartment size were agreed upon and unified. Škoda recieved a permission to work on a new type of turret (cast one) as well as on the new 100mm tank gun in two variants (designated AK1, that was developed along with the 100mm R11 and 100mm A20 – the development of those two started however earlier – end of 1948). The AK1 was ambitious: It was to be a 100mm L/55 (5500mm barrel length) gun, capable of firing a 14,75kg shell at 900 m/s. The second variant of AK1 was L/53 (or rather 52,7, as the barrel was 5270mm long) with the shell velocity of 890 m/s. On 23.1. and 24.1.1950, it was decided for the ČKD X-shaped diesel engine to be used. Around this time, Ing.Suring was informally selected as the leader of the entire project because of his contributions. He started working in Škoda on 6.2.1950 in order to get the work going. Two variants were considered: both had the same hull and cast turret, but one had an H-shaped engine and the other had an X-shaped engine. Surin had only 14 days actually to come up with the drawings – he immediately requested the turret to be made lower and sleeker – as a result, on 10.2.1950, Ing. 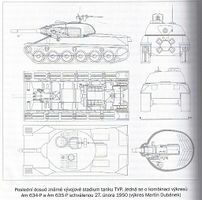 Zíka from Škoda presented two drawings with the lower turret (only 800mm tall), including 1:10 wooden mockups. Both options had different mantlets – from front, one was oval-shaped (German style) and one was triangle shaped, the latter being selected. By the end of January, the shape of the hull was also discussed, including the number of roadwheels (ČKD had 5 pairs, Škoda had 6 pairs). Apparently, the 6-pair solution was adopted after some pressure from military liaison Maj.Hajšman. It was also decided that one entire prototype hull from armor steel would be produced by VŽKG (Vítkovice steelworks), while three more hulls from regular steel would be produced by Škoda. Škoda and ČKD would then cooperate on further development, while the turret would be developed exclusively by Škoda. Each company would then independently develop the engine, the transmission, drivetrain, steering mechanism, pedals, seats, fuel tanks and engine access ports. Engine air filters were to be developed by ČKD, while Škoda was to develop the suspension, ventilation and electric wiring. Furthermore, both companies were tasked with solving the implementation of the Soviet V-2 engine as a stopgap measure, because the high-power diesels still remained only on paper. What it meant in total was that Škoda would do most of the work, because ČKD was tasked also with the development of the universal LP chassis (light chassis for light tank/light tank destroyer/light SPG use). On 15.2.1950, the number of planned prototypes was reduced to three (two from soft steel, one from armor steel). Furthermore, each company was to build two prototypes of their engines (Škoda – 16 cylinder AHK, ČKD – 16 cylinder AXK) with transmissions and ČKD was to solve the issue of implementing the Soviet V-2 engine. TVP transmission was actually built and tested in 1949 on a T-34/85 tank (as a part of the T-34/85 upgrade program) and the results were promising. The suspension was now planned to be a torsion bar one, but there were problems with their manufacture. Even though ČKD was developing their own engine air filters, Škoda came up with a plan to use captured Panther air filters. ČKD in turn came up with a proposal to use hydraulic gun elevation control and Ing.Surin came with a plan to introduce a mechanical automatic loader, but both plans were declined by the military representatives. The key date for development was 27.2.1950, when a meeting took place at Czechoslovak tank army HQ. The committee that assembled approved the final version of the TVP project, which however lacked specific details. Both drawings were actually made earlier (18.2.1950) and the Praga one bears the name of “TNH tA”. These drawings are however missing the assumed bow machinegun and the driver’s hatch. T-50/51 was also compared to the T-34/85 tank (that was still in service) and came out favourably. The 100mm gun was able to penetrate 140mm of armor (60 deg) at 1000m and the vehicle was supposed to have superior maneuverability, given the 1000 horsepower AHK/AXK engine and better suspension. However, it was also heavier than the T-34/85. It was also considered for frontal and rear parts of the hull to be cast instead of welded and General František Papoušek was interested in the automatic loading mechanism. The meeting also confirmed previous production distribution and plans and both companies promised to deliver soft steel prototypes until 30.4.1952 (plus the armor steel prototype until 31.12.1952). However, even in 1950 it was clear that neither Škoda nor ČKD would have mass production capabilities (especially given the fact that the ambitious plan counted on mass production after 16 to 22 months from the prototype introduction). Major Hajšman also assumed the full documentation of the tank could be sent to USSR for assessment in November 1950. On 4.3.1950 a meeting took place, where the decision of the Minister of Defense to stop the T-50/51 development was adressed. Forced by the Soviet Union and pressed into accepting the Soviet tanks into their army, the Czechoslovak High Command had to abandon the support of the project. The engine itself was to be further developed and the armor development also ran for a while after. The development was entirely cancelled by the decision No. 15705 sometimes later in 1950, including the development of all TVP-based projects (tank destroyers, SPG’s). Few months later, all the independent design and construction works in Czechoslovakia were ended and that marked the end of the last truly independent Czechoslovak tank project. All the production capacity was in the meanwhile used for the T-34/85 and in 1955, the first T-54 arrived in Czechoslovakia as a precursor to full-fledged license production, that ran practically until 1981 in one form or another. This page was last modified on 18 May 2018, at 18:24. This page has been accessed 81,562 times.